Years long ago, we had a 5-CD Sony player hooked into a receiver with a double-cassette deck, the brand of which escapes me now. Good speakers. No turntable, as by then (1991) we – like many folks – had moved full-force into the age of the shiny platter. What I loved about that system was this: fading in or out when making a mix tape. 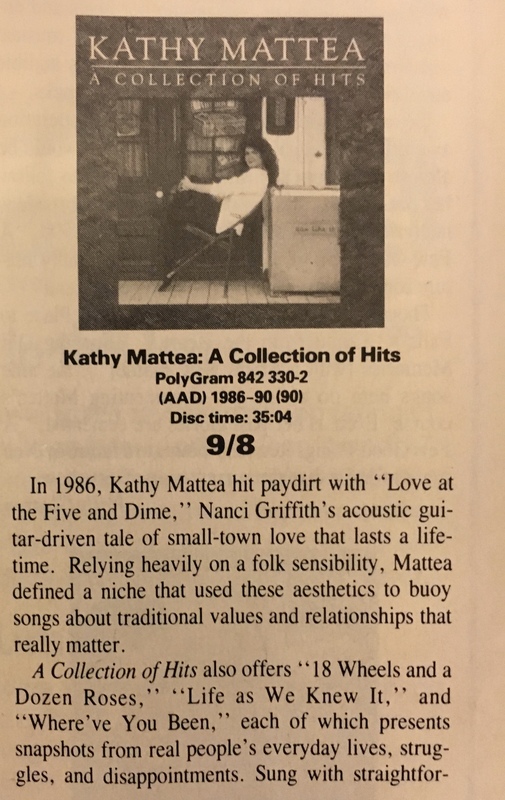 I could open a tape with, say, a minute-long rendition of “Drift Away” by the 10,000 Maniacs, lifted from the 1994 In the Garden of Eden bootleg, where it tracked with “Hey Jack Kerouac”; and close the side with the Beatles performing a ragged version of “Rainy Day Woman #12 & 35” during their Get Back sessions, the audio verité manner of the bootleg it hailed from (Songs of the Past Vol. Whatever, I believe) making it part of a track longer than the 1:10 it actually is. The 5-CD platter was an even better feature. Diane and I chose two discs each, agreed on a third (or flipped a coin), hit shuffle and…away the night would go, the two of us obsessively playing any of a number of games – Acquire was quite the habit for a time. Trivial Pursuit was another. We had good friends in South Philly – usually we’d go to them, as they had a dog (and lived close to Nick’s, which had the best hot roast beef sandwiches in the region); occasionally they’d come out to us, though if they did the night never went on quite as long, as they had someone who needed tending. Regardless, a good time was always had. I’m getting ahead of myself by a few years. What can I say? Time flies; and memories intermingle. The point I was going for: In the pre-Internet age, information wasn’t a few mouse clicks away. Life was slower. If you watched TV, you watched – no “second screen.” If you listened to music, you might do something else – read a book or magazine, play a game, etc. But, often, you (or I) just listened. 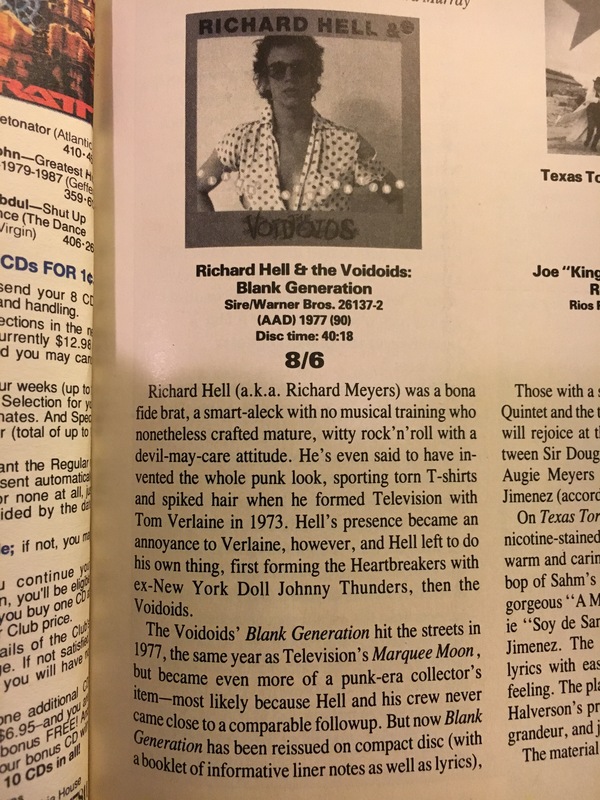 And for information on music – the local newspaper might have a weekly column about it but, really, fans were reliant on magazines, including Rolling Stone, Record, Spin, Creem and Circus, along with a slew of fanzines. By the late 1980s, two additions were added to my menu: ICE, the International CD Exchange, which was more of a newsletter; and Digital Audio and CD Review, which went in-depth into digital gear and CD sonics. The reason for those last two: Not everything on vinyl was available on CD. And some that was, well, let’s just say the sound quality was lacking. The first few Byrds releases on compact disc, for instance, sounded like the master tapes had been put through a blender. Likewise, Simon & Garfunkel’s Collected Works came from second-generation masters because Columbia lost the originals. The result sounded okay, but it’s not as good as, say, the re-reissues from a few years back, which were redone from tapes one step closer to the source. 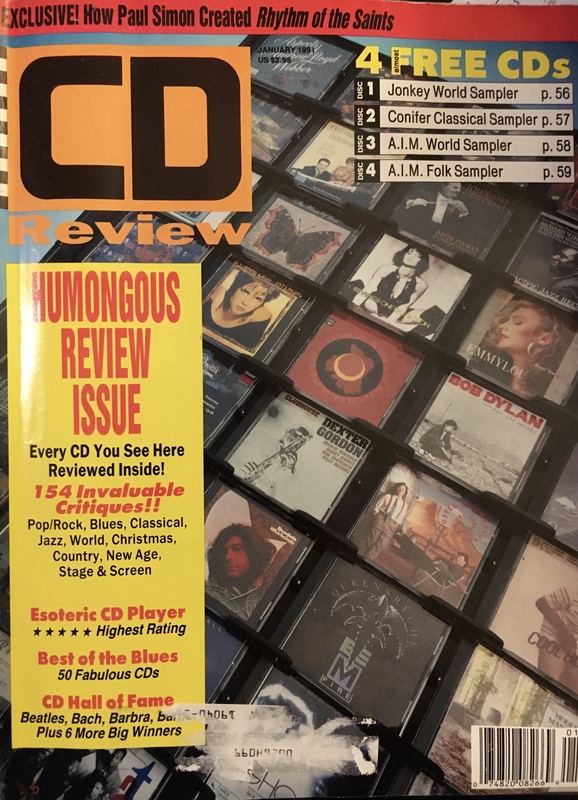 Anyway, at some point, Digital Audio and CD Review dropped the first three words of its title. 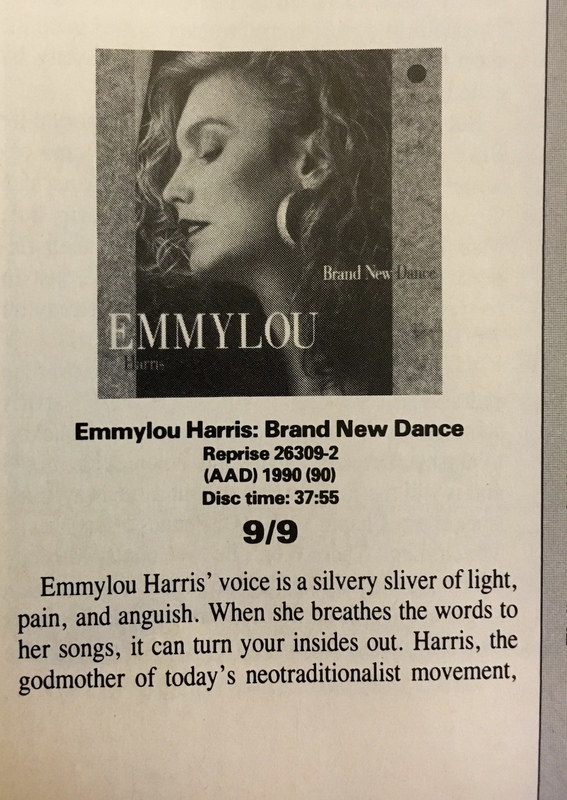 CDs were graded for both artistic and sonic elements, though the reviews themselves often said little about the audio quality. Onward to today’s Top 5: January 1991. 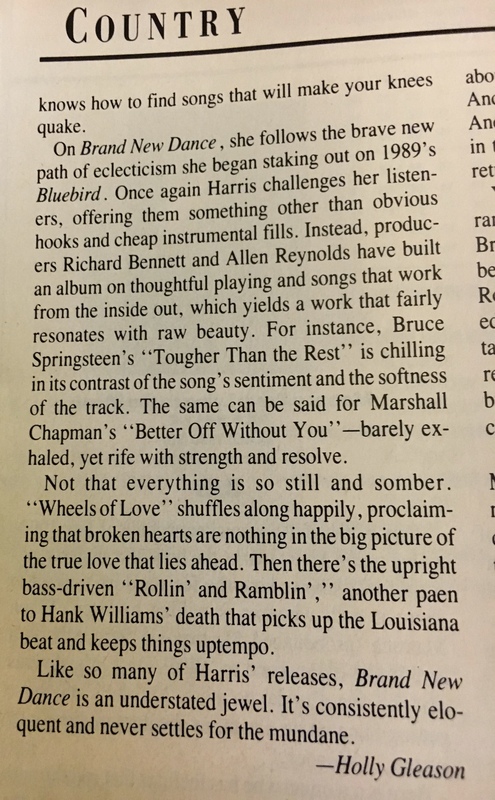 1) Rosanne Cash – “What We Really Want.” Holly Gleason opens up her review of Rosie’s 1990 release, Interiors, with: “Rosanne Cash never has been one to be content with just wearing her heart on her sleeve. She also puts her anxieties, misgivings, and rage out there—and it’s made her one of the most honest, affecting artists of any genre of the ‘80s. To my ears, it’s one of the greatest singer-songwriter albums of all time. And this song is as true today as it was then. 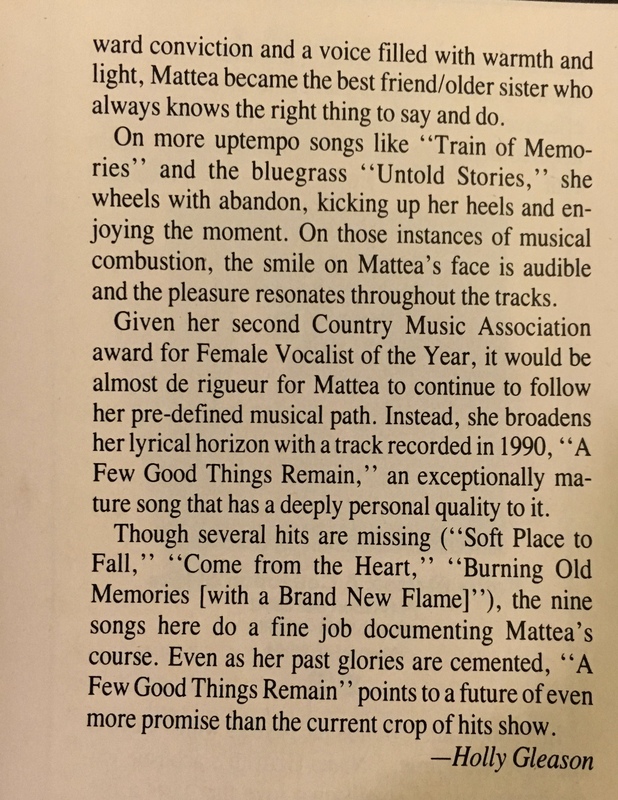 3) Kathy Mattea – “A Few Good Things Remain.” In the late ‘80s and early ‘90s, Mattea was on a roll, hit after hit, and racking up ACM, CMA and Grammy awards. Diane and I saw her two or three times in that span at the Valley Forge Music Fair – she always put on a good show. 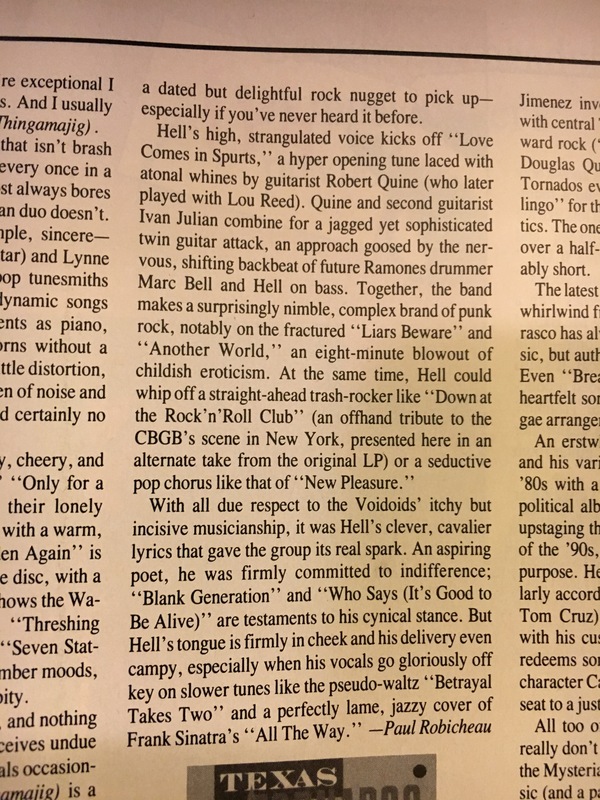 5) Richard Hell & the Voidoids – “Blank Generation.” Paul Robicheau explains that “Blank Generation has been reissued on compact disc (with a booklet of informative liner notes as well as lyrics), a dated but delightful rock nugget to pick up—especially if you’ve never heard it before.” True, that. I really like the behind the scenes mixtape making stuff. I achieved similar effects with a Pioneer Tape Creating Amplifier the CA-100from J&R Music. (My future wife bought for me as she was the prime beneficiary of my mixtapes. From there I graduated to a simple Realistic brand DJ mixer from Radio Shack. Both units are in boxes in the garage. I guess rather than critical reviews, I’ve always been interested in the release dates (WHEN!) or stories about how CDs and box set releases came about. Details like how difficult it was to locate master tapes and what condition they were in or what processes were used to restore them. But in the end, it’s all about the music and how it sounds where and when I listen. You mention listening to music in the background as opposed to listening to music while doing nothing else. While I am most certainly guilty of having music on no matter what I’m doing even “watching” TV, there are most definitely times each week where I will sit and listen in a comfy chair or out on the patio by the pool under the stars with the occasional coyote howl or yelp in the mix. Or in tonight’s case, under scattered clouds. As you sometimes do, you stumped me with all five picks this time out so I’ve added them to my listening queue for the week. Thanks.